A game where a spaceship flies back and forth shooting aliens and monsters in space. 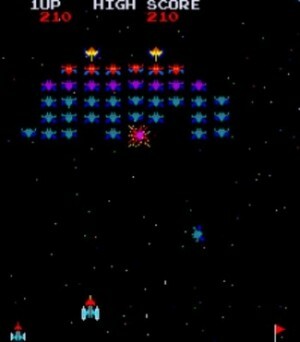 You are a space fighter pilot who must shoot wave after wave of aliens that look like dragonflies. You must shoot the aliens and their boss. Here are some tips for shooting the aliens: kill the boss and his two escorts, then shoot them when they are doing a somersault.